Magento is a very powerful and fast growing eCommerce script, created by Varien. It is an open-source platform using Zend PHP and MySQL databases. Magento offers great flexibility through its modular architecture, is completely scalable and has a wide range of control options that its users Appreciate. Magento Themes are considered as best themes for eCommerce. Magneto Themes are extremely customizable, easy to use and fully responsive. 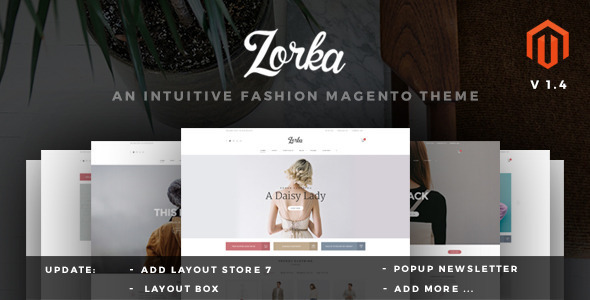 Zorka is an extremely powerful and flexible premium magento theme with responsive & retina ready design. Specially perfectly fits trendy fashion website with a strong, sweet and elegant style. It embodies a sensible design with a product-centered layout to captivate every customer’s heart. It has included a variety of skins, It is built upon Bootstrap 1170px Grid, and it has Retina Ready Icons. It has been designed pixel perfect and meets the newest trend web experience. Bauhaus with exciting color style in design is borned to bring new breath and happy color to your store. Bauhaus has ideas and inspiration for all types of eCommerce stores, including: Fashion, Shoes, Jewelry, Watch, Hi-tech,…and more. Based on the latest bootstrap technology, this Magento theme its self prides its unrivaled responsiveness and mobile-friendliness. ClearShop is an extremely powerful and flexible premium magento Theme, specially perfectly fits trendy fashion, bag website with a strong, sweet and elegant style. comes along with a neat, eye-catching and straightforward design that has everything you need. It embodies a sensible design with a product-centered layout to captivate every customer’s heart. It is built upon Bootstrap 1170px Grid, and it has Retina Ready Icons. MT Soul is responsive parallax magento theme with unlimited layout options and a lot of unbelievable features. It’s suitable for any store such as: fashion, retail, furniture, Jewerly, accessories, beauty, cosmetic, flowers, kids toy or any store. Bewear is uber clean and modern eCommerce Magento Theme with Lookbook / Collection style to inspire your clients with your products, is an extremely powerful and flexible premium magento theme with responsive & retina ready design. It is built upon Bootstrap 1170px Grid, and it has Retina Ready Icons. It has been designed pixel perfect and meets the newest trend web experience. Sahara is the newest design from Plazathemes, has been created as a mega store Magento eCommerce solution for online stores. This magento theme shows a sophisticated look, well-structured layout and most powerful features of a ecommerce store.